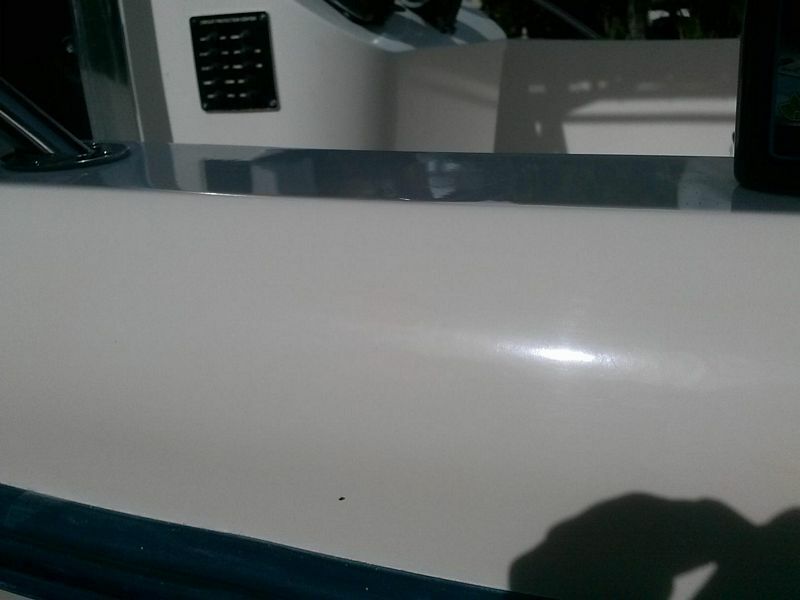 Here are a few pics of a extremely oxidized boat I did yesterday. 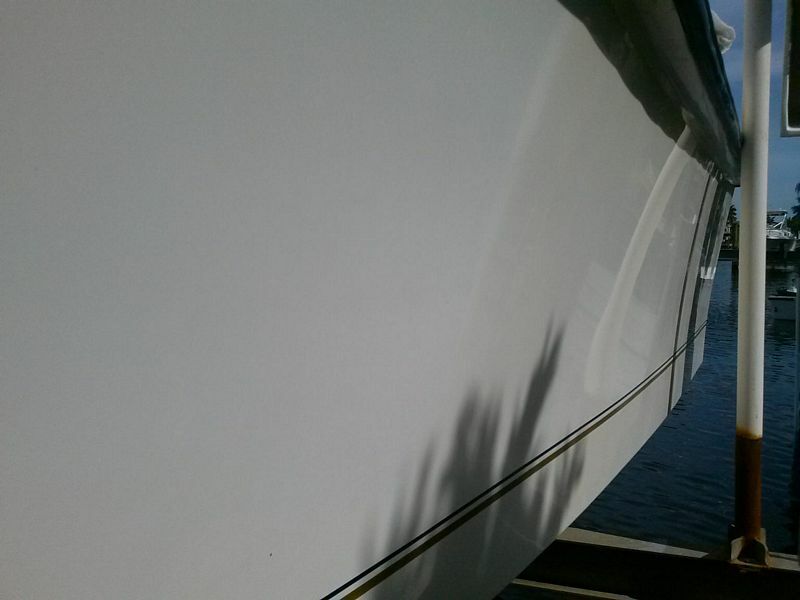 I used the Marine 31 Gel Coat Heavy Oxidation Cleaner, on a wool pad with the Flex 3401. The customer wanted as much shine as possible from a one stage polish. So I spent most of my time polishing and finished with a spray wax. It would have been nice to sand and properly polish but that's not always in the cards. After working with you I can already tell you and I are alike in that we have a sincere passion for perfection no matter what the job. Fact of the matter is however that as a marine detailer, you can't work for free and time is money. In situations like this I think you did the right thing by matching the best service you could do for what the customer was willing to pay for and the end-result is dramatically better than before. In this picture, for everyone looking, look real close and you can see a completely different color of gel-coat after the compound and waxing. Here's a copy of the first picture above only I've placed arrows pointing out the line between before and after. The after side is the back half where you can now see reflections. The before side is the front half that is dull and flat like a piece of chalk. big difference andy, in the before and after shot. i thought that was just a lighting problem in the picture. very nice. Thank you for posting your results. I was really wondering what kind of finish the heavy cut left behind. I'm happy to see it doesn't leave behind a marred finish. 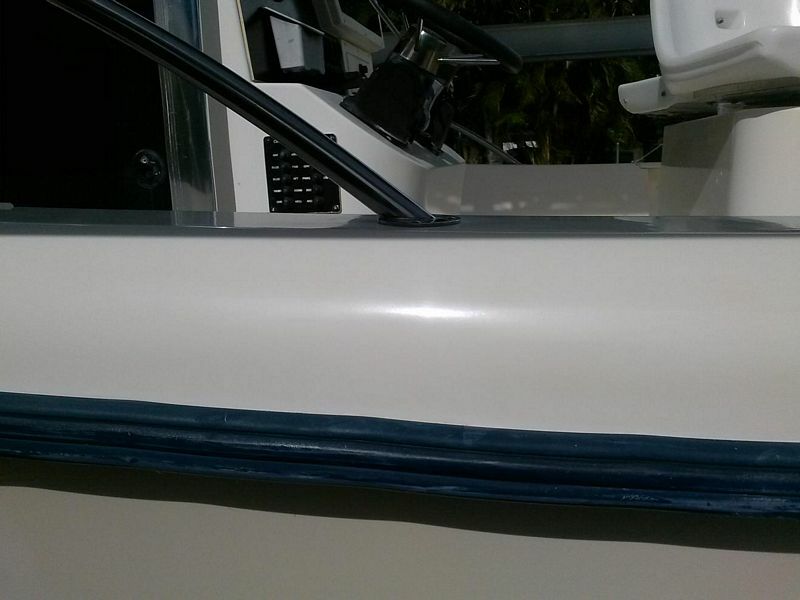 I'm going to be doing a multi step process next week with the Marine 31 on my Sea Ray, not too far from you at a DIY yard in Port Charlotte by Rotonda West. I'm excited to see the end result. Thanks for sharing Andy, Appreciate the picture. 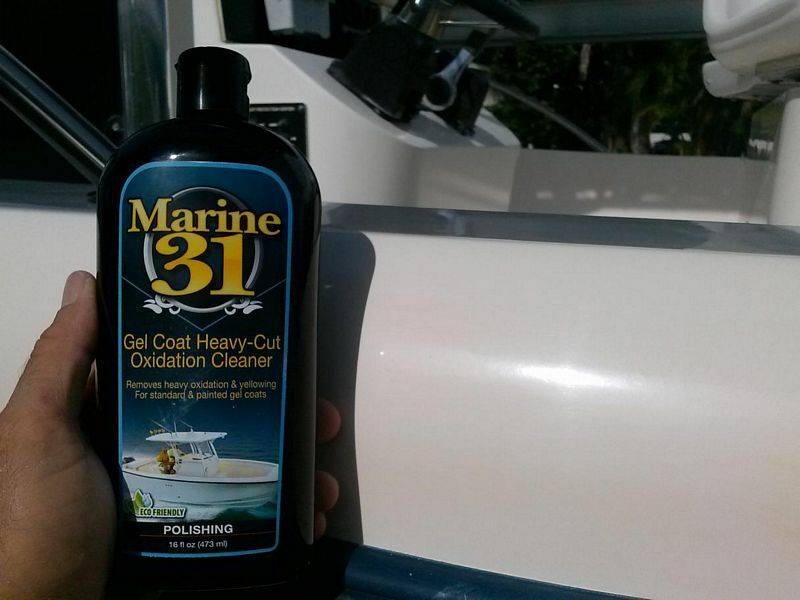 I got 4 different Marine 31 products in just this week but didn't get any of the HCOC, oh well, get it next time around. Good to now that you can go straight to the spray wax, but what about on a say! black, red, or any other bright colors. Would you have any marring issue's, or just lighten up on your speed & pressure on the last pass or two? Nice results. What wool pad where you using on the flex and how did it hold up? I too struggle when customers or friends don't want to spend more time or money to do things the way I want! Still a huge improvement.